Cattle, rabbits, poultry, swine, sheeps. Light yellow powder, soluble in water. Pigs: treatment of dysentery, colibacillosis, pasteurellosis, salmonellosis, as well as diseases of the digestive tract and respiratory system caused by microorganisms sensitive to oxytetracycline, colistin and trimethoprim. Calves, lambs (aged up to six weeks), rabbits: treatment of animals suffering from enteritis and respiratory diseases caused by microorganisms sensitive to oxytetracycline, colistin and trimethoprim. Poultry (hens, turkeys, pheasants, geese, ducks) suffering from mycoplasmosis, colibacillosis, pasteurellosis and respiratory diseases caused by micro-organisms sensitive to oxytetracycline, colistin and trimethoprim. calves and lambs (aged up to six weeks), pigs (individually) – 0.5 g of drug per 10 kg of body weight, 2 times a day during 5-7 days. Do not administer to animals with hypersensitivity to the drug. Do not use for laying hens, eggs of which are used for human consumption. 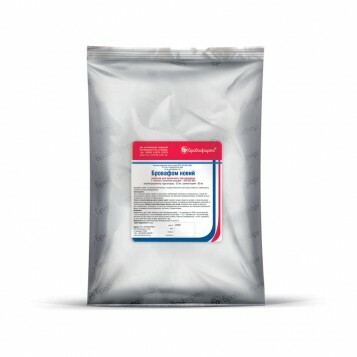 Package of polymeric materials of 10, 100, 250 and 500 and 1000 g.
Store in a dark place at the temperature from +8°C to +25 °C.